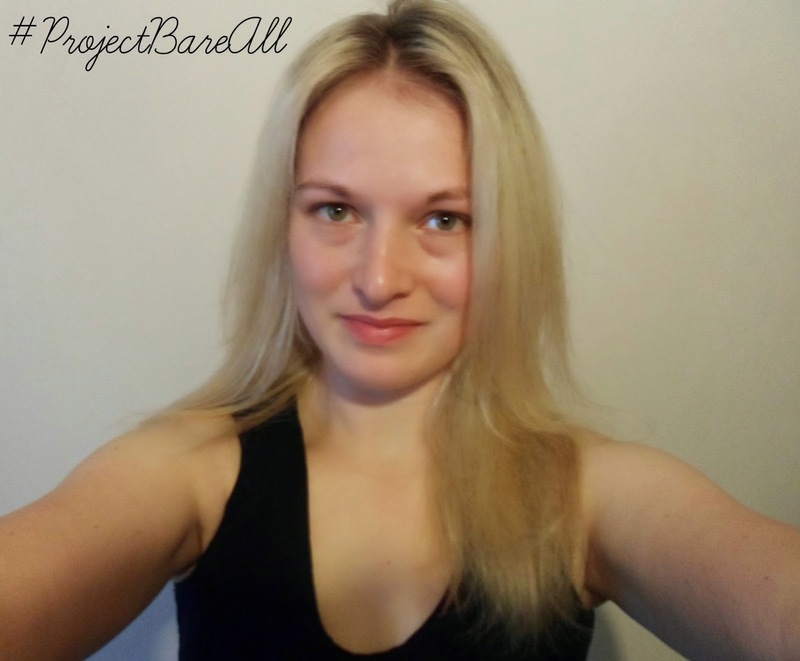 Recently the lovely Megan form Thumbelina Lillie asked/challenged/tagged me to join in with her amazing new blogging project - #ProjectBareAll. I'm very lucky to talk to so many lovely bloggers on a regular basis (total babes) I always feel so inspired by them and love the sense of community that us "beauty bloggers" have and this post is something that really struck a cord with me personally and something that I think everyone should join in with! #ProjectBareAll is simple - it is all about having confidence without that safety blanket we call make-up. I, for one, am guilty of wearing make-up near enough all the time and I treasure those days where I feel I don't have to apply it! Don't get me wrong I love love love make-up.... a little too much really but it has become the norm for me and I do not feel myself or confident enough to go about my daily life without it. We all have our hang-ups mine range from my small eyes to my sparse eyebrows to my awkwardly shaped nose and don't even get me started on the dark bags under my eyes! But with make-up I feel like I can make myself feel slightly better about those little hiccups on my face. I've worn a full face of make-up probably since starting high school, which is actually 10 years ago now and for me now the thought of going out or to work with no make-up on is... well.... bloomin' scary! I think the main thing for me is how different I think (do) I look without it, I've taken a few make-up free pictures in the past and have always had comments come my way from people I know fairly well saying things like "it looked nothing like you" or "you look so different without make-up" - this I obviously took as a bad thing and so it is rare that you will see a make-up free photo of me, well until now! So there it is, my #ProjectBareAll bare face (and arms apparently). The list of things I've picked up on looking at this photo is endless but this project is all about confidence and I need to find mine so this post is going up and I am going to make myself feel good about it! I urge you all to go and read Megan's post (and follow her amazing blog - it is one of my favs!) and join in yourself whether it be on your blog, Instagram, Twitter or even Facebook - just use the hashtag #projectbareall and rock that bare faced look! I did a instagram bareskin selfie but never thought of making it into a post to spread the word! I loved this post so much! I love the message it is spreading through the beauty blogging community! We need to love the skin we're in and not feel like we have to hide behind make up and clothes to fit in. I'm thinking about doing this at one time but not right now. I still need some time. Some day I will be confident enough! Hello from Newcastle (and Asia).